I wrote this essay as soon as the house was built. At that time, I was confident that it would perform well, but there was not yet any evidence to show it. Many blog posts in the category “Indoor Climate” now fully justify my early confidence. There is an indexed list of dozens of relevant blog posts at the bottom of “My House Page” in this blog. Natural energy from the sun and air heats and cools this house. It needs very little electric power, and no gas or firewood. Windows mainly facing north let in the sun’s heat only in winter. The concrete floor, and brick walls inside the house store the heat. The house keeps winter heat in, and summer heat out, by various means. These include: insulation, double glazing, air-locks at the doors, and shading of the east and west walls. • It will need very little electricity, and no fire-wood, gas or other fuel. 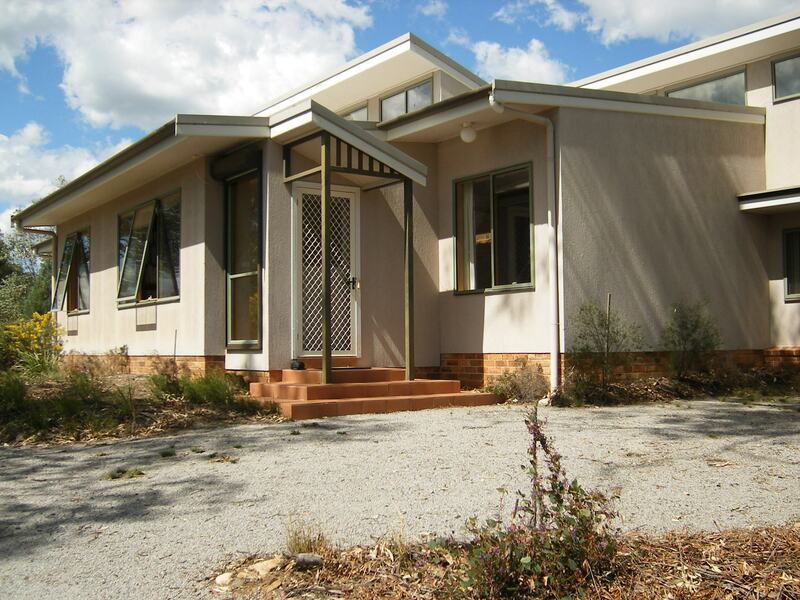 Australia now has many low-energy (or “energy-efficient”) houses. Several books, such as “Warm House Cool House”, explain the principles (See Reading List). This low-energy house is of the kind called “solar-passive”. Solar-passive houses use a proper balance of “glass, mass, and insulation”. The house will catch and store the heat of the sun in winter time, and keep out the sun’s heat in summer time. It will also keep out cold winter air, but let in cool breezes on summer nights. The house does not have any “solar-active” devices, such as a solar furnace or solar air-conditioning. Nor does it generate its own power, from the sun or by other means. Manilla’s climate is ideal for a solar-passive house. Because the skies are mainly clear, there is plenty of winter sunshine, and the summer nights are cool. Every unusual feature about the house is designed either to use natural energy flows, or to keep them out. The path of the sun is different in summer and winter. Like many people, I did not realise until recently how this difference affects the comfort of a house. Houses can be miserable to live in because they receive too much summer sun and too little winter sun. In mid-winter the sun rises in the east-north-east and sets in the west-north-west. At noon in Manilla (latitude 31º) the mid-winter sun is only 36º above the northern horizon. Sunshine will stream in any north-facing window from dawn to dusk. East- and west-facing windows will get a little sun, while south-facing windows will get none. In mid-summer the path of the sun is quite different. It rises in the east-south-east and sets in the west-south-west. At noon the sun is almost overhead, only 8º from the vertical. North-facing windows will get hardly any sun, and none if the roof has eaves. South-facing windows will get some early morning and late evening sun. East-facing windows get sun all morning, and west-facing windows get sun all afternoon. To have comfort in a Manilla house, we should let in the winter sun and keep out the summer sun. We can do this simply by facing most windows to the north, and sheltering them by eaves. We should not have windows facing east or west, as they admit so much summer sun. West-facing windows are worst, because they let the sun in during the hottest part of the day. A few south-facing windows may be needed for light or for views. They let in no useful winter sun, although they don’t let in much unwanted summer sun either. To allow for many north-facing windows, I wanted the house to be long from east to west. The shape of the block of land was not very favourable. In the end, I faced the house 8° west of true north, and stepped back the axis of the house towards the south-west. In the north walls I put a large window in each room. North-facing clear-story windows carry sunshine further in to the house. The total area of north-facing windows is 20 square metres. This is 70% of the window area, and 13% of the floor area of the house. Although there are some trees to the north, they shade the house only slightly in winter. There are no west-facing windows. The one small east-facing window is completely shaded by eaves in summer. Only 29% of the window area faces south. A sun-porch at the front door also traps the winter sun. This enclosed porch has a full-height north-facing window. Heated air from the porch is admitted to the house by opening the inside door. Eaves shade all north-facing windows. The line from the edge of the eaves to the bottom of the window has a slope of 2:1. Sunshine begins to come in below the eaves in mid-March, and is again shut out seven months later, in mid-October. For the five hotter months no sun enters the north-facing windows. In summer the eaves shade the whole of the north wall to ground level. I have protected the east and west walls of the house from the heat of the summer sun. A double garage shields the east wall to the full height of the house. The west wall has an upstairs veranda (a talar) almost 3 metres wide, fitted with canvas awnings. Under the veranda there are two 10,000 litre water tanks. When full, they will contain 20 tonnes of water. This large mass of water will tend to keep a steady temperature. Two white box trees (Eucalyptus albens) 25 metres high shade the house on summer afternoons. Heat can be stored inside a house in heavy materials that have a high specific heat. These include rocks, soil, concrete, bricks and water. The greater the mass of these materials, the greater is the thermal mass of the house. Such materials are slow to heat up, but hold their heat for a long time. A concrete floor, or a brick wall, heated by the sun will keep the house warm at night. If the following day is overcast, the house will still be warm. In summer, when the day temperature is uncomfortably hot, the same thermal mass can keep the house cool. Breezes can strip heat away from the thermal mass at night, and it will remain cool the following day. On the outside of the house, thermal mass materials, such as brick veneer walls and tile roofs, do not add to comfort inside the house. They absorb too much heat on summer days, and radiate away too much heat on winter nights. Light-weight materials are better. Brick walls inside the house weigh about 17 tonnes. The concrete floor slab weighs 28 tonnes, and is mainly surfaced with dark-coloured ceramic tiles to absorb and radiate heat. Winter sunlight falls on much of the surface of these walls and floors. I include the volume of earth, gravel, bricks and concrete extending 500 mm below the floor slab as part of the thermal mass of the house, because I have insulated around the edge (see below). This makes a total of about 200 tonnes of thermal mass. The temperature of this mass will not change much over periods of days or even weeks. Manilla’s average temperature is 16º. I hope the floor of the house will stay a few degrees warmer than this all year round. The cladding of the house has little thermal mass. It is light coloured to reflect heat. The walls are clad in cellulose fibre reinforced cement building board with an off-white textured acrylic finish. The roof is pale grey pre-painted steel. A low-energy house must be protected from heat and cold by a shell of insulation. Any kind of wall or roof insulates to some extent. The insulating effect is expressed as an “R-value” (for thermal Resistance). Ordinary walls, whether wood-framed with weather-board, or brick veneer, or double brick, are about R = 0.50. Unlined roofs with ceilings are about R = 0.70 in summer and R = 0.35 in winter. If one adds bulk insulation or reflective foil insulation, one can add the R-value of the insulation to that of the wall or roof. In our climate it pays to increase the total R-value to about R = 2.50 in the walls and R = 3.50 in the roof. Plain window glass has R = 0.17, which is only one third that of an ordinary wall. The area of windows should be no more than is needed for sunlight and fresh air, and perhaps for views. Close-fitting curtains with pelmets can add as much as R = 0.33. Double glazing adds R = 0.17, and low-emissivity glass adds R = 0.09. Air leaks through the protective shell may occur through poor sealing of doors and windows and their frames. Reflective foil insulation (R = 1.0) is used in the walls and the roof. Bulk insulation as glass-fibre batts is installed in the walls adding R = 2.0, and in the roof adding R = 3.0. These values are higher than usual, which relates to the very high thermal mass of the house. To protect the soil and footings under the main concrete slab from heat gains and losses, this mass has also been insulated. Sheets of 50 mm polystyrene foam are placed vertically inside the strip footings to a depth of 300 mm to 900 mm. The edge of the floor slab, unfortunately, could not be insulated without risking termite entry to the house. All windows on insulated walls are double-glazed awning windows. They are aluminium units with concealed frames (Rylock Victoria Series) that have a 5-Star winter rating. Room level windows are fitted with heavy curtains and pelmets. The clear-story windows are not only double-glazed but use low-emissivity glass (Pilkington K-glass). Windows and doors are well sealed. The ducts to fans in the kitchen, bathrooms, and toilet are self-closing. Open windows and doors provide plenty of fresh air. One can open two of the clear-story windows in summer to draw air through the house by the “chimney-stack effect”. Air inside the top of the house is usually warmer than the air above the roof. This will make it rise, like the smoke from a chimney. I have placed windows and doors so that cool evening breezes can blow through the house from north to south, or vice versa. Manilla is well sheltered from winds, but the house site is more exposed than most places. Fans placed high up in the clear-story spaces serve two functions according to the season. On summer nights they are angled outwards to assist the stack effect by ejecting warm air through the clear-story windows. On sunny winter days they are angled inwards to blow hot air down from the top of the internal brick walls. This allows the heat to be absorbed in other parts of the house, rather than being radiated away from the warm bricks at night. Exhaust fans expel odour, vapour or smoke as required from the kitchen, bathrooms and toilet. I use a heat-pump hot-water service (Quantum). This operates like a refrigerator except that it heats rather than cools. It has a compressor, which pumps fluid to evaporator panels mounted on the roof. If this system is run in the daytime, it uses about one-third of the electric power of a hot water service that has a heating element. Unfortunately, it will not save power if it is run in the cool of the night, when cheap “Off-peak 1” power is available. I have been authorised to use “Off-peak 2” power, but the cost saving, compared to a heating-element system using “Off-peak 1” is very small. I have had to make compromises. The refrigerator is quite large, so as to have the benefit of an automatic control that reduces its energy use. The dish-washer is an expensive model that allows the washing of small loads with small amounts of water. I use motors on the curtains of north-facing windows. These are very expensive. The reason for having them is that these curtains, in five different rooms, should all be opened and closed at the same time each day of summer and winter. In winter they should be opened each morning to let the sun in, and closed each evening to keep the warmth in. In summer, they should be closed each morning to keep the heat out. Then they should be opened each evening, along with the windows, to allow the house to cool. A clock controls the motors. In future I may use a radiation sensor. The house was assessed for its energy requirements according to the Nationwide House Energy Rating Scheme (NatHERS V2.11). The NSW HER Accredited Assessor Max Mosher granted the house a 5-Star rating. Estimated total energy requirement was 63 MJ/m².annum (18 kWh/m².annum). This graph is an example of temperature data collected later, that shows how successful this design proved to be. All these books can be found in libraries. “Warm House Cool House” by Nick Hollo, (1995), Choice Books, 172 pages, ($27.50). “Energy Efficient Housing for New South Wales” by J.A.Ballinger, D.K.Prasad, and D.J.Cassell, (1992), Office of Energy (now SEDA: Sustainable Energy Development Authority), Government of NSW, 121 pages, ($25.00). “Australian Solar Houses” by Matthew Parnell and Gareth Cole, (1983), Second Back Row Press, Leura, NSW, 215 pages. “Passive Solar Design in Australia” by Jack Greenland and Steve Szokolay, (1985), RAIA Education Division, Canberra. “Australia’s Guide to Good Residential Design” by RMIT and Energy Victoria, (1997), National Office of Local Government, Department of Environment, Sport and Territories, Canberra, 60 pages, (gratis).